With the 2014 Sochi Olympic Winter Games in full swing, it’s interesting to note how the global and temporal nature of the Olympics brings with it both risks and rewards for brands sponsoring or leveraging the event. Four years ago Elastic Path ran the online store for the 2010 Vancouver Olympics. I caught up with Elastic Path co-founder and executive Vice President, Mark Williams, to learn more about the challenges of running a store where almost all sales were condensed to a two week period. I learnt that the merchandizing of the Olympics was indeed a balancing act. All it took was Oprah holding up her hands wearing Canada’s Olympic mittens to sell over 40,000 pairs in 2 hours. Or how the preferred purchase color of the Canadian hockey jersey was red, until the home team won in white, spawning a rush on the overstocked, less-popular colored jersey. Consider Procter & Gamble, a consumer goods company with products in more than 180 countries. The company’s sponsorship of Team U.S.A. in the Vancouver 2010 Olympic Winter Games was a resounding success, resulting in an estimated $100-million in incremental sales. The brand also benefitted considerably, as its corporate advertising campaign yielded 39% higher brand recall and 62% higher message recall than average Olympic ads. The Canadian Olympic Committee has sent a “cease and desist” letter to The North Face, charging that the clothing maker’s new line is infringing on its trademark by trying to associate with the Sochi 2014 Olympics. The North Face is not an official sponsor of the Games — the Bay spent millions to be primary clothing sponsor for next month’s Games in Russia. But The North Face launched the “international collection” in November featuring a T-shirt with the date of the opening ceremonies “07.02.2014” and other clothing with a patch saying “RU 14,” a reference to the Russian Games. As tightly controlled the Olympic brand is, ambushers need to weigh out the risk versus the reward of this form of marketing: Does it damage or enhancement their Brand’s image? What if the entire product line is seized? 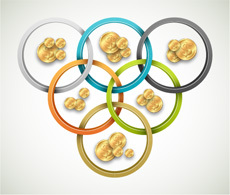 The 2012 London Summer Olympics marked a major change in how the Olympic brand was communicated. With over 150 million tweets sent during the 16 day competition, the crowd, home viewers, sponsoring brands and the athletes themselves extended the brand experience to now include real-time conversations and opinions of all involved. A Greek triple jumper has been expelled from the Olympics after she posted a racist joke on Twitter. Voula Papachristou was kicked out of her national team for mocking African migrants and expressing support for a far-right political party. While viewers and athletes can – in aggregate through social media – speak much louder than any single advertising campaign, the Wild West nature of Twitter means that brands – including the Olympics – need to be prepared with a contingency plan to deal with off-brand messages. Sporting events such as the Olympics, the World Cup, or “March Madness” offer too many matches to fit into traditional broadcast schedules. In the past, of course, viewers were limited by the programming schedule and what was shown during prime time, as broadcasters viciously edited content, leaving most of it on the cutting-room floor. Today, however, media companies can deliver live and on-demand content online and monetize it with dynamically inserted ads. This change in viewing patterns will no doubt affect traditional media buys, with a higher proportion of spend being placed on dynamic ads or sponsorship messages within streaming video. The opportunity to leverage the instant popularity of an athlete, a win, a goal, or a stunning defeat are all techniques a smart marketer can now use to increase brand affinity within this new viewing paradigm. By culling data from trillions of visits, Adobe Digital Index has identified that Google Glass looks to be heading for use as a future media-consumption device rather than as a shopping device. In fact, Web sites seeing the highest penetration of Google Glass visits are media and entertainment with sports being the most popular content in this category. Google Glass may not only change the platform on which we view future Olympic games but may also change the perspective from which we view them – shifting from remote camera to first-person, through-the-lens of the athlete point of view. On demand video, Glass and other wearables such as those measuring pulse and other body vitals, have the potential to bring us deep inside the world of the athlete, not only during the Olympics events, parties and official ceremonies, but before and after the official dates, opening up the possibilities to leverage the Olympic brand on a continual basis rather than the current four year cycle.